Women fashion changes every day. Experimenting variety of outfits and styles is the trend. Yet, women across generations have been wearing Punjabi salwar kameez for most festivals and occasions. 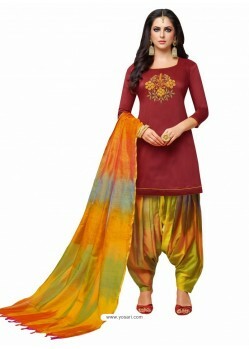 The modern woman has integrated Punjabi Patiala suits in her style. As the name says, this is a style originated from the Patiala city of Punjab, India, and is now becoming the style icon. They are also known as ‘Shahi Salwars’. How Punjabi Patiala Suits are different? Punjabi Patiala suits are flowy in the pleated style ensemble. The Punjabi Patiala suits are not same as the regular suits. The Patiala salwars flowing pleats offer a different trendy look and the Patiala kameez look attractive, when paired with short tops or kurtis. It looks beautiful and has now attained the position as the stylish ethnic attire with a touch of traditional look. Punjabi Patiala suits require 3 to 3.5 meters of cloth, almost 1 meter more than the regular suits. The fabric is required extra for the pleats in the salwar that offers a heavily pleated look. It gives a fold upon fold layer style look till the upper thighs. Fashion designers have shown creativity in patialas and also have altered the kurtas or kurtis length, changed necklines, sleeve styles, deep back necks, standing collar necks, and more. These suits are now glamorized with embellishments, embroideries and works in the salwars. What is the specialty of Punjabi Patiala suits? Patiala salwars come in different fabrics such as Brocade, Crepe, Cotton, Chiffon, Georgette, Jamavar, Jacquard, Net, Shimmer, Satin, Silk, Viscose, and more. The specialty of the Patiala suits is that the salwars are in bright colors, stylish patterns and is beautified with traditional embroidery works. The salwar has a border at the bottom known as ‘Patti’. You can include beads, mirror work and sequins to add a glamorous touch. The Patiala suits are teamed with short kurtis and a dupatta in a stole type. The Patiala suits are acclaimed as stylish ethnic attire presenting a unique blend of prints and colors. Nowadays, at YOSARI, you can find varied colors ensuring the wearer a stylish look. What are the Reasons for popularity? 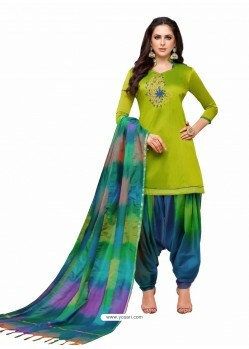 Comfort: Speaking about fashion, it is very comfortable to wear Patiala suits and do all types of work. In fact, this is one of the key reasons that there is increase in the demand for this style. Patialas are ideal for summer as they are easy to wear and are very comfortable. In addition, the varieties and styles available in this outfit give you the chance to look smart and comfortable in this outfit. Versatility: This is a feature that cannot be ignored. 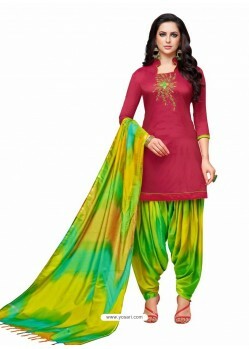 Patiala suits are perfect for any casual and formal occasion. The garment comes in unique styles to suit different occasions. For instance, for formal occasions such as festivals or weddings, wear fabrics such as silk or crepe and decorate it with mirror work, rhinestones and embroidery. 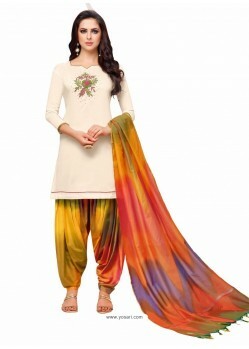 While wear cotton or chiffon Patiala suits as a casual wear. It is ideal for house makers, girls and working women. Perfect for your body: Wearing dresses that suit your body is very important to look confident, comfortable and smart. 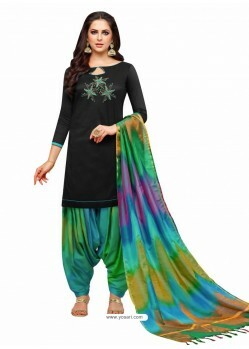 Patiala suits fulfill all these requirements and come in different styles. They also come is different materials adorned with works; so choose that meets your need. Punjabi Patiala suits never go wrong with any measurement or body type. This dress offers a graceful look and suits all, right from college goers to pregnant women and seniors, everyone looks beautiful. Here are some tips that help in choosing apparel complimenting your looks. - If you are on the bulky side, consider fabrics such as soft cotton, soft silk, linen, crepe and georgette. Avoid chiffon or polyester, as they hang and make you look bigger. The best choice is to go for silky fabrics as they stay clinging to your body. - If you are too slim, go for thick cotton, heavy silks, jute and spandex blend cotton, also with chiffon. They give you added volume and look pretty. - Heavy women may avoid open back designs, deep neck and sleeveless as your flesh may appear protruding. 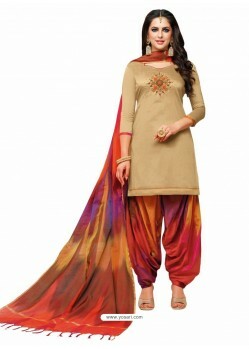 - If you are tall, wear Patiala suits with short tops, it offers a shapely volume balancing your height. - If you are short, wear fit straight tops and elongate your frame with vertical designs and wear a matching pair of heels. 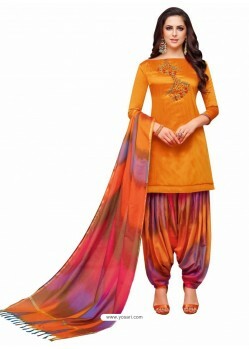 How to procure Punjabi Patiala suits? Punjabi Patiala Suits are the modern day fashion and their detailing on the fabrics had made them widely popular. There are endless choices with modern twists making it one of the classic styles. The online shopping experience has enhanced the demand and YOSARI ensures to offer stylish dresses that are the most sensuous and make women look beautiful. Why YOSARI is the preferred online shop for Punjabi Patiala Suits? YOSARI offers an array of collection. The dresses are presented in such a way that even online you can get the detail of the dress, front and back view. You can be confident about the dress to be delivered at your doorstep as we ship in India and also to other countries such as Australia, USA, UK and Canada. Moreover, our 14-day return policy, allows you to send us any apparel back and to get full refund. It is a win-win shopping at YOSARI. Start shopping online now.